Through relationships with the Association of California Symphony Orchestras, Arts Reach, the Association of Fundraising Professional, the Nonprofit Development Center and the National Dinner Theatre Association, Henry Ruddle has consulted with and presented to thousands of arts organizations and other nonprofit organizations. He has been published dozens of times in arts marketing journals and currently produces a series of Expert Eye for the Marketing Guy (or Gal) webinars for Arts Reach. Henry also produces an e-mail newsletter for arts marketers called Arty Face, in which he discusses a principle of good design, copywriting or marketing, and then illustrates it with a good ("smiley") example, a bad ("frowny") example, and a third amazingly good or astoundingly bad example he calls a "wowza." 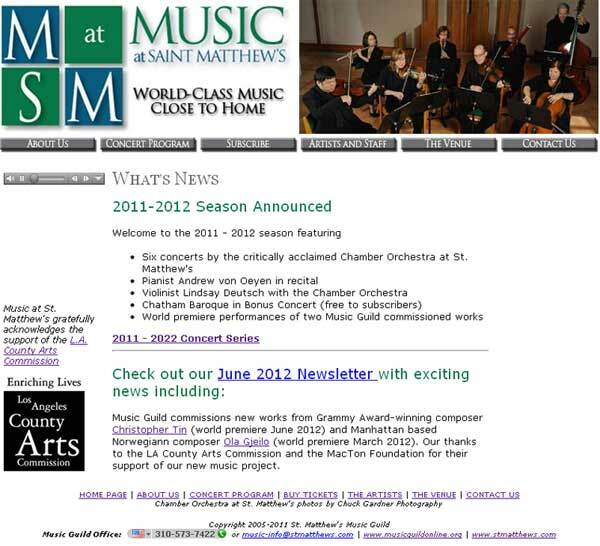 You can subscribe for free at arts.ruddle.com, his arts marketing blog. For more information or to start work, email Henry or call us at 1-408-600-2687. "Wow! Thanks for the detailed feedback. This is very helpful, and I’m going to pass it along to my graphic designers as we prepare to do next year’s brochure. You really are the Go To Guy for detailed analysis of collateral." "Thought you'd like to see the brochure for our new season. The response has been overwhelming: 91% of last year's subscribers renewed! 125 new subscribers." "Thanks for your interest and expertise. My Board and I are very excited about the direction you're taking us." "Your advice was so helpful! Thank you. We will definitely implement your suggestions the next time we print our brochures." "At first I thought it was going to be difficult to read what someone 'from the outside' had to say... In the long run, I am pleased to have a different and outside account of the process, which served (and will continue to serve) as a tool for us to refine our process and improve this weak area within our organization." "I want you to see how far we've come... and the impact of your input on us, both in your presentation, as well as the one-on-one consultation we were fortunate to share with you. We found your advice about our brochures to be most helpful. We were able to communicate your ideas to our designer and create marketing pieces that reflect our museum more positively." BEFORE: Too dark, not enough empathy and too many buttons. The designer for the music guild tried to connect the artform to real people by using close-up snapshots of players' hands. Each image represents a section of the orchestra. Sadly, it doesn't work because almost of the social instincts we humans share are keyed to faces and facial expressions. Hands can convey body language if they are moving, but otherwise don't speak to our emotions. AFTER: New branding, lots of people, few buttons and a bright, clean look. BEFORE: Do these brochures really come from the same place? When I met with Gwen and Jessica from Midway Village, the first order of business was to address the startling variety of brand images put forth by their brochures. The old brochures were also a little bit intimidating and hard-to-comprehend for a newcomer. In the primary brochure at left, the next thing readers see after "Midway Village" is "Rockford, Illinois." Midway Village ... is this a housing development? A shopping center? It takes a dedicated reader to scan all the way to the bottom to see "Museum Center," although that still doesn't make it clear that this is a "living history museum." AFTER: Yes, I know what this is now! No doubt about it, these brochures come from the same place, which is clearly a living history museum with beautiful grounds and a lot of activity. I'm excited. I have no reason to care about Rockford, Illinois, but I just might visit this place just to check it out. At left, the style of season brochure used by the Chorus of Westerley in 2005-2006 and for several years prior. The new Executive Director wanted help because subscriptions were healthy but stagnant. Westerley is a small coastal resort town but was not reaching the tourist trade. The old brochure was incomprehensible to anyone who didn't live in Westerley, so we had two pieces of advice for the cover of the brochure: 1) Put the name of the organization prominently at the top, and 2) Use one or more photos to convey visually that the brochure was about classical choral singing involving adults and children. If a tourist or new resident saw the brochure in a literature rack, they would immediately know what it was about. Unfortunately, the board's marketing committee was used to doing things its way, and instead of using the cover we suggested (left), it insisted on the cover at right. 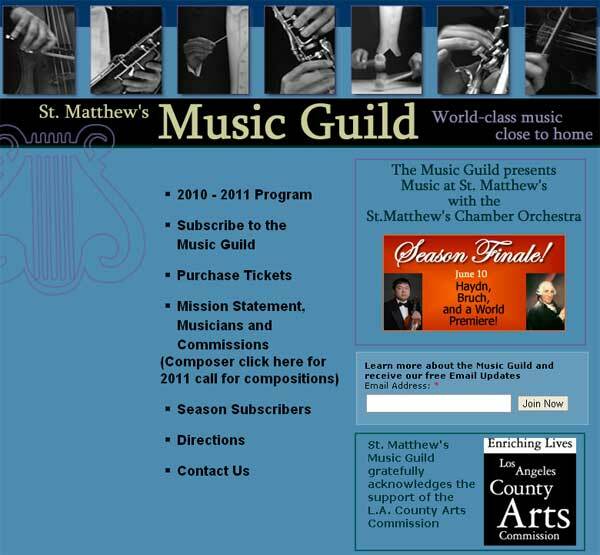 After another consultation with Henry Ruddle, it became clear to the Chorus' president and executive director that the marketing committee's direction of the 2006-2007 season brochure was such a disaster that the entire process would have to be revamped. 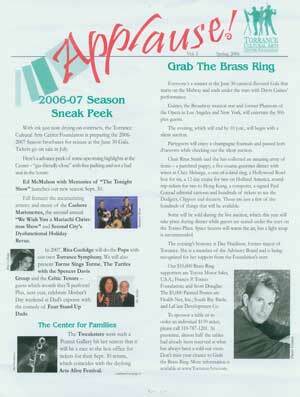 With the marketing committee no longer involved in artistic decisions, the executive director was able to implement the intended direction for 2006-2007 with the materials for the 2007-2008 season, resulting in the brochure cover at right. The chorus' name is at the top (though not as prominent as we would like), and the collage of photos clearly shows a conductor and string instruments (classical music), along with adults and children singing. 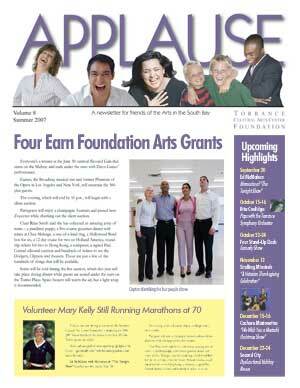 Although connected to a performing arts center, Applause is produced by the Torrance Cultural Arts Center Foundation, which does not have the same communications mission as the Center itself. Readers of Applause do not need a "sneak peak" at the upcoming season or features on performers because it gets that information elsewhere. Readers of a Foundation newsletter expect to find out how their donations are being used and why they should continue to support it. Also, the stagnant two-column format offered no focal point other than the clumsy nameplate at top, leaving readers without a clue as to where to start and how to tell one thing from another. The new format focuses both visually and with content choices on the donors to the Foundation. The photos in the nameplate represent various demographic groups within the support base, as well as those served by the Foundation. There are still a few highlights of the upcoming season, but they are listed primarily to connect the Foundation with the Center and add a little bit of celebrity glitter. Now that there is a clear focal point (the photo of the four people standing) and a clear hierarchy, the mission and audience of the Foundation take center stage, while the newsletter still makes visual and textual reference to the resource which the Foundation serves.